From the ﬁeld to the screen, licensed product rules this year with fresh toys inspired by every fandom, including sports, cinema, and beyond. A new generation of toy companion apps enters the market. R/C manufacturers respond to the category’s continuing sales decline. 46 Bigger, Bolder, Newer, Older! A new trend emerges as kids and collectors embrace the 5.5to 6-inch action ﬁgure scale and beefy stance of the 1980s. 48 Go Ahead, Play With Your Food The toy industry embraces foodie fun with a slew of new edible toys. Moving forward from the unboxing trend, collectibles have evolved to feature a bigger reveal that ultimately leads to greater play value. The Toy Book Volume 35, No. 2 THE TOY BOOK (ISSN-0885-3991) is published bi-monthly by Adventure Publishing Group, Inc.® Editorial and advertising ofﬁces are located at 307 Seventh Ave., Room 1601, New York, NY 10001, Phone (212) 575-4510. Periodicals Postage paid at New York and additional mailing ofﬁces. Copyright © 2019 Adventure Publishing Group, Inc.® All rights reserved. No part of this publication may be reproduced or transmitted in any form, or by any means, electronic or mechanical, including photocopy, recording, or any information storage and retrieval system, without written permission from the publisher. Printed in USA. Subscription rates: $48 one year, foreign $200. The Toy Book is a trademark of Adventure Publishing Group, Inc.® Registered in the U.S. Patent & Trademark Ofﬁce. Postmaster: Send address changes to: Toy Book, c/o Adventure Publishing Group, 307 Seventh Ave., Room 1601, New York, NY 10001 or e-mail bill@toybook.com. Opinions and comments expressed in this publication by editors, contributing writers, or solicited or unsolicited documents are not necessarily those of the management of The Toy Book. to see how action figures have evolved over the past few years — and why the 5.5- to 6-inch action figure scale of the ‘80s is back. We also take a deep dive into plush (page 22), R/C and vehicles (page 36), and collectibles (page 52), including commentary and product showcases for each category. Flip through the pages to see how these categories are performing this year and find out what hot toys will hit store shelves. 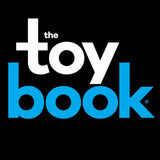 I sincerely hope you enjoy this issue of the Toy Book, and I welcome any feedback and thoughts on our issue. Send over an email, or tweet at us @ToyBook. We’d love to hear from you! » Maddie Michalik is the managing editor of the Toy Book and senior editor at the Toy Insider and the Pop Insider. She reports on new products and toy industry trends, and has been featured on broadcast TV stations in the U.S. and Canada. Contact her at maddie@toybook.com. Jennifer Gibbons, vice president of state government affairs. Mond works closely with members to help them understand and comply with existing and pending federal legislation and regulations. She also helps companies navigate issues related to importing and the federal agencies involved in toy importing and sales. Gibbons works on issues related to product safety, chemical regulation, and environmental sustainability at the U.S. state level, working to minimize potential conﬂicts of state rules while educating on the existing federal structure that ensures toy safety. Christian Wetterberg, senior director of product safety and compliance at The LEGO Group, rounds out the course with his insight into the international landscape. Wetterberg also chairs both the European and ISO technical committees on toy safety and is a recognized international expert in the area. The Safety Education Program consists of about six hours of curriculum presented in webinar format and is delivered via 11 modules. At the end of each module, participants must correctly answer questions on the content in order to move ahead. Participants who successfully complete the program receive certiﬁcates of completion from The Toy Association. As standards change, course materials will be updated. The Safety Education Program is a free resource offered to all Toy Association members. Non-members may access the program for a fee. Learn more by visiting the “Education” tab at toyassociation.org. » As The Toy Association’s senior communications specialist, Kristin Morency Goldman leads the development of content for the Association’s print and online communications. Her articles on toy trends, toy safety, and industry news can be found in trade and consumer publications around the world. She holds a master’s degree in media, culture, and communications from NYU. they have in development.” The inventor category will include both seasoned pros who have already produced products and are looking to grow into new channels or license their product, and inventors who are new to the industry and are looking for guidance on how to bring their idea to the next stage. Membership is by application only. • Ambassador: If you were a long-term member but you’ve been out of the toy industry for at least six months, perhaps there is an Ambassadorship in your future! The Ambassador category is a way to maintain your membership as an individual so you can keep up with ASTRA and attend our events. “Members build so many relationships and gain so much valuable experience over many years of involvement with ASTRA,” Warfield says. “When they leave the toy industry, many members don’t want to lose us and certainly we don’t want to lose them. Now we have an affordable way for them to stay connected and involved at whatever level suits their interests.” Membership as an ASTRA Ambassador is by application only, and a maximum of ten ambassadors will be added annually. • Student: “For our industry to be healthy, we need to attract top talent and grow our talent pipeline,”Warfield says. “The next generation of retailers, manufacturers and sales representatives need a place to learn about the toy industry and the opportunities that are available to them in this fun and exciting world of toys.” There are many directions ASTRA can take in its work with this new category, such as possible internships, opportunities to work on committees, and participating in job fairs, just to name a few. The main point, Warfield says, is that ASTRA can offer a new look at career paths that may otherwise be unknown to many post highschool students. ASTRA EXPANDS ITS REACH ASTRA’s new membership categories are another way that we are fulfilling the directives from our board of directors in the latest strategic plan. To advance the interests of our members and their businesses, the plan seeks reinforce the long-term viability of the industry through cultivating industry talent and expanding ASTRA’s reach into other markets that will grow the community. Watch for the details of each new membership category or contact Sue Warfield at swarfield@astratoy.org for more information. We are excited to bring these new memberships into our network and to continually improve our member services. It’s part of achieving our collective goal to change the world through the power of play within all the communities served by ASTRA members. » Kimberly Mosley, president of the American Specialty Toy Retailing Association, is an experienced, award-winning, results-oriented association executive with a long track record of success in managing association operations, developing innovative programs, and growing revenue. “Online content can initiate that ‘gotta have it’ buzz, skyrocket website and social platform trafﬁc, and boost sales.” Performance Indicators an influencer can provide and deliver on before entering into an agreement. More followers doesn’t always mean better results. 5. Compensation There are a number of ways to work with influencers, and not all require deep pockets. If your product or entertainment property is coveted, try a barter arrangement. According to the ANA survey, 35 percent of companies work on barter, providing free product in exchange for influencer coverage. One of our clients has gotten fantastic content simply by sending free product to tweens in the product’s target age group to demonstrate. Be sure to specify what you expect from them in return. 6. Sponsored Content Rules If you’ve engaged a social influencer to work on behalf of your brand, make sure that they follow Federal Trade Commission guidelines for flagging their sponsored content with hashtags, such as #ad or #sponsored. Per FTC guidance, disclosures like #thanks, #collab, #sp, #spon, or #ambassador are insufficient. If they do not, this can make or break a campaign. » Julie Livingston is president of WantLeverage Communications, a NYC-based public relations and business development consultancy that specializes in consumer products, education/ed tech, and related industry associations. She spent six years leading marketing communications for The Toy Association. More information can be found at wantleverage.com. India’s ChuChu TV is the latest YouTube channel making the jump into licensing in the U.S., with Brandgenuity serving as its agent in North America. In collaboration with Dream Theatre, its global master licensing agency, ChuChu TV looks to harness its audience of more than 36 million subscribers for success in toys, publishing, and other product categories. The YouTube channel has captured more than 23 billion views with reinvented classic nursery rhymes and famous kids’ songs, such as “Wheels on the Bus” and “The Finger Family.” Since its launch in 2013, ChuChu TV has become one of the top YouTube Kids brands in the world. Catering to kids ages 2 to 8, it averages more than 500 million views per month across its family of chanSTAY CONNECTED! Adult Captain Marvel Hero Suit, from Rubie’s Costume Co.
to deliver a portfolio of products and brands based on our core values that connect with children and families, and offer the highest standards in product. How do we evolve? We listen to the consumer and create exciting ﬁrst-to-market trends that we integrate into our lines. This — along with innovations to our classic evergreen play patterns and toys — allows Imperial Toy to continuously make an impact. Currently, the biggest trend areas are tactile and sensory toys and compounds. We also are building on beauty, food, grossout, and prank items. TB: How have the outdoor and novelty categories changed over the past few years, and how has Imperial Toy kept up with those changes? PT: We are a market leader in the bubble and novelty category. We offer a good/better/ best model in bubbles with our Miracle Bubbles, Super Miracle Bubbles, and Blitz Bubbles premium bubble solutions. Also, our speed to market is a key strength in supporting the business. We have a key advantage with our worldwide facilities, including those in Mexico, Hong Kong, the U.S., the UK, Italy, and Canada. and the fun is going beyond the players. Mascots are on ﬁre, and they’re popping up everywhere. Super7 has action ﬁgures and Super-Buckets, while Funko is releasing mascots in its signature Pop! Vinyl format. And it’s not just mascots from MLB getting in on the action. Uncanny Brands has plush ﬁgures of team mascots from across the NBA and NHL appearing in its Bleacher Creatures collection, including the hottest mascot right now: The Philadelphia Flyers’ Gritty. Motorsports are also hot, with a NASCAR line on the way from Far Out Toys and vinyl ﬁgures of famous drivers coming from Funko. Feld Entertainment Inc. just kicked off a 10-year partnership with Spin Master for an all-new range of Monster Jam toys, while Bigfoot — the original monster truck manufacturer — returns to toy aisles thanks to deals with Mattel, Greenlight Collectibles, and New Bright. THE LEGACIES Warner Bros. Consumer Products’ global rollout for Batman’s 80th anniversary and continued expansion for The Wizarding World of Harry Potter are two prime examples of legacy brands poised to do big business across hundreds of licensees. Comic book heroes and retro interests are hitting the right notes for kids and adults alike. Basic Fun!, which already has a range of retro products from Fisher-Price to Lite Brite, will relaunch Texas Instruments’ Speak ‘n Spell. Meanwhile, Super Impulse continues to bring more licenses into its line of World’s Smallest and World’s Coolest collectibles. These days, classic brands are popping up everywhere we look. Lions and tigers and llamas, oh my! Some might call it a trend, others might call it a takeover. Whichever way you slice it, there’s no denying that llamainspired products are all the rage. Here’s a look at some of our favorites. LINKIMALS LIGHTS & COLORS LLAMA FISHER-PRICE The Fisher-Price Linkimals Lights & Colors Llama teaches babies ages 9 months and up about colors as they grasp and stack three colorful, translucent rings along the llama’s neck. The wobbly base teeters back and forth for fun play, and lights and sounds add to the experience. RAINBOW SPARKLES LLAMACORN GUND GUND’s Rainbow Sparkles Llamacorn is a soft and textured blush pink plush animal that is as magical as it sounds. The 15.5-inch plush creature features sparkly rainbow hooves, a twisted horn, ﬂexible wings, and a ﬂuffy tail. The surface is machine washable for easy cleaning. H20GO! POP LLAMA BESTWAY Bestway’s H20GO! POP Llama is a super-sized ﬂoat that’s ideal for pool time. The puncture-resistant vinyl features a colorful design and includes three separate air chambers. Kids can grip it with ease thanks to two rubberized hand grips on the llama’s neck. The Llama Love Ultimate Baking Party Set includes two large llama and cactus cookie cutters and a llama-shaped silicone mold for kids to bake llama-shaped treats. The kit also includes recipes for Llama Party Cake, Llama-rama Frosting, and more. Who’s Your Llama is a line of collectible llamas with unique personalities and articulated legs. Each collectible ﬁgure comes dressed in a soft, molded outﬁt and a headpiece, and includes one of four interactive features: winking, spitting, grinning, or sticking its tongue out. Kids can collect all 12 llamas in Series 2, which comes packaged in blind bags. The Who’s Your Llama line also includes Who’s Your Llama Mini Collectibles Series 1 and Who’s Your Llama Plush Series 1, available this spring. Technically, this is an alpaca. Despite this fact, we don’t discriminate. Mattel’s Hackin’ Packin’ Alpaca game challenges kids ages 5 and up to stack pieces of cargo on Al the Alpaca’s back. If players fail to stack a piece before the time runs out, Al will spit water at them. The ﬁrst player to stack all of their pieces wins. I LOVE LLAMAS ANN WILLIAMS GROUP New to Ann Williams Group’s Craft-tastic line, the I Love Llamas craft kit includes 160 pieces for kids to fuel their llama obsession with engaging activities. With this set, kids ages 7 and up can create their own pom-pom bracelets, stuffed llamas, headbands, charms, and more with six separate llama-themed craft projects. BOPPI, “THE BOOTY SHAKING” LLAMA ZURU ZURU’s Boppi, “The Booty Shaking” Llama is the newest addition to its robotic Pets Alive line. It features unique twerking and head-spinning dance moves and grooves to three different songs. A new generation of toy companion apps enters the market. by MADELEINE BUCKLEY, assistant editor ON FIRST LOOK, IT SEEMS THE TOY industry has stumbled upon two dueling trends: at the same time that “screen-free play” and “classic play” are becoming industry buzzwords, dozens of companies are releasing companion apps for their toys. It sounds paradoxical that these two trends could coexist and thrive at once, but the two ideas may not be quite as separate as they seem. David Kleeman, senior vice president of global trends at kids research and development agency Dubit, says the entire concept of “screen time” is somewhat ﬂawed from the start. When looking at kids’ interaction with technology, time isn’t necessarily the best indicator. He says there are some screen-based behaviors with which parents are happy, which is key. Madeleine Buckley is an assistant editor at Adventure Publishing Group, where she contributes to the Pop Insider, the Toy Insider, and the Toy Book. She enjoys covering the latest news and trends the toy industry and pop culture. comprised of teddy bears that kids cuddled with at night, and that’s about it. Plush has come a long way since then: Now they talk, they sing, they dance, and they double as key chains, room decor, and even collectibles for kids to proudly display. Some come in blind bags and others have their own companion apps. They leak into all different categories and go way beyond the typical teddy bears of the past. Animals in costumes, interactive pets, and, of course, llamas are everywhere this year. Unicorns are still huge, but companies are getting more creative with unicorn hybrids, combining the mythical creature with other animals to create new breeds such as caticorns and llamacorns. Puppets are becoming more popular, growing $1.8 million in the 12 months ending this January, according to The NPD Group. Jacqueline Cucco is an associate editor at Adventure Publishing Group. She writes for the Toy Book, the Toy Insider, and the Pop Insider, and is in charge of all things Instagram. When she’s not watching slime videos, you can ﬁnd her playing paparazzi for her pet bunny Peepers (@ thebigpeep on Instagram). Micro Squeezamals, from BEVERLY HILLS TEDDY BEAR CO.,, are miniature versions of the brand’s regular Squeezamals. Each character is squishy, soft, and slow-rising. They are sold in packs of three in which two characters are showing and one character is hidden for a surprise reveal. Each character is sweetly scented. FOLKMANIS launches a labradoodle, a robot, and a mini shark puppet this spring, all designed for kids ages 3 and up. The Folkmanis Labradoodle puppet is 20 inches long, and kids can animate its mouth and head. The Folkmanis Robot puppet is a 16-inch, vintage-looking automaton with a movable mouth, arms, and digits. The Folkmanis Shark finger puppet is 8 inches long. SQUISHABLE launches the blind box debut of Sparkles the Narwhal, a 2.5-inch plush keychain that is individually wrapped and packaged. In Series 1, Sparkles the Narwhal tries out eating, wearing, and even being some of his favorite snacks. The plush is designed for kids ages 3 and up. Squishable expands its line of Undercover Squishables. The 7-inchtall plush animals have four different bases (corgi, kitty, bunny, and panda) and fully removable, swappable outfits. There are additional disguises sold separately. Undercover Squishables are designed for kids ages 3 and up. PILLOW PETS adds Secret Life of Pets Pillow Pets to its collection, featuring Max, Duke, Snowball, and Gidget from the movie. The plush transforms from a character into a pillow sleep buddy. MOOSE TOYS expands Scruff-a-Luvs with ScruffBunnies. They arrive as a sad ball of a-Luvs Blossom Bunnies matted fur, but kids can bathe them, dry them, and brush them to reveal what’s underneath. Blossom Bunnies are available in green, pink, or yellow, but the color remains a mystery until kids open the package. Each Scruff-a-Luv Blossom Bunny includes a brush for grooming, a flower crown, and an adoption certificate. WICKED COOL TOYS adds the 10-inch Pokémon Detective Pikachu Movie Feature Plush to its Pokémon collection. The plush features two voice modes: Detective Pikachu and Pikachu. Kids can press its chest when they want to hear Detective Pikachu speak, and press it again when they only want to hear Pikachu’s voice. Designed for kids ages 6 and up, the plush figure also features more than 14 responses, motorized ears, and a detective hat. BASIC FUN! launches Cutetitos Babitos this fall. Babitos are 3-inch plush animal characters — including a Giraffito, Owlito, Chipmunkito, and more — with hot spot personalities that come hidden in a burrito blanket. Each of the 12 different Babitos characters also comes with a gender-reveal diaper. Pound Puppies are authentic reproductions that look and feel like the originals, available this fall. There are a variety of puppies with different facial and eye expressions, ear lengths, and fur colors in an updated soft material. Each comes in a pet carrier-shaped package and includes a tag, a care sheet, and official adoption papers. Each line is designed for kids ages 3 and up. YOTTOY’s Paddington Stacking Toy features a gingham-printed base tower and three different sized rings for babies to stack and build. The Pigeon Jack-in-the-Bus is a musical toy featuring a tin bus and a 5-inch plush Pigeon, made to celebrate The Pigeon’s 16th birthday. Kids can turn the crank to hear “The Wheels on the Bus” play, and when the tune ends, a 5-inch plush Pigeon will pop out of the bus. Both toys are designed for babies ages 6 months and up. ISCREAM introduces the Unicorn Furry Neck Pillow, featuring a horn and rainbow glitter detailing, and the Rainbow Furry Neck Pillow, a rainbow-shaped pillow. Both are designed for kids ages 5 and up and feature snap closures. Iscream’s UFO Embroidered Scented Pillow and Space Shuttle Embroidered Scented Pillow are bubble gum scented, feature bright colors and metallic accents, and are made for kids ages 5 and up. JAZWARES launches MeBears as part of its Russ Berrie family of brands. MeBears was created by 11- and 12-year-old sisters Sage and Carmin. Each MeBears measures 5.5 inches tall and is made from a soft velboa material. The MeBears all have their own distinct personalities, talents, and passions to celebrate uniqueness. There are four styles of bears launching under the Fantasy Kingdom series, with more styles to come in the next series, Food Court. Jazwares adds to its Feisty Pets line with two 10-inch plush pets, Toby Toejam and Treacherous Travis, that turn from happy to feisty when kids squeeze them. The Disney Junior Minnie’s Walk & Dance Unicorn Feature Plush, from JUST PLAY, PLAY is inspired by the Disney Junior series Minnie’s Bow-Toons. Minnie Mouse is dressed in a rainbow outfit and plays music from the show, including the song “Giddy Up Penelope.” Kids can press Minnie’s hand to see Penelope, Minnie’s unicorn friend from the show, dance, or they can attach Minnie’s hand to Penelope to watch the friends walk together. The feature plush will be available in the fall and is designed for kids ages 3 and up. The Disney Dumbo Fluttering Ears Dumbo is a 13-inch-tall plush animal based on Disney’s latest live-action film, Dumbo. When kids ages 3 and up press Dumbo’s foot, his ears flap up and down and he plays elephant sounds. Dumbo is made with soft fabrics and embroidered detailing. AQI introduces its San-X authorized and licensed Rilakkuma plush, based on the new Netflix show Rilakkuma and Koaru. Koaru. The Rilakkuma Space Plush is 15 inches tall and features Rilakkuma wearing an astronaut outfit. The Rilakkuma Tiger Eating Fish is 13 inches tall and features Rilakkuma dressed Rilakkuma Space Plush as a tiger. AQI adds to its Amuse collection with the Amuse Yellow Alpaca, a 13.5-inch smiling alpaca with a polka dot ribbon, and the Amuse Grey Sloth, a 20-inch fluffy sloth with soft, long arms. All items are recommended for kids ages 3 and up. AURORA launches YooHoo Sacks, tiny versions of the characters from the Netflix show. YooHoo is an Aurora World original brand created to bring awareness to rare and endangered animals, as well as the conservation of their habitats and the natural world. Kids can juggle, stack, and collect YooHoo Sacks. Sequin Sparkles, from the Sea Sparkles line, feature mylar hair that kids can comb. They also have sequin tails with scales that can flip to show different colors. They are designed for kids ages 3 and up. KELLYTOY’s Squishmallows Hug Mees KELLYTOY feature a new 3D look with hands, feet, or paws. There are eight super-soft Squishmallows Hug Mees, including two unicorns, two foxes, an alpaca, a blue bear, a sloth, and a raccoon, all available in four sizes: small (10 inches), medium (14 inches), large (18 inches), and jumbo (20 inches). Each Squishmallow character’s backstory is detailed on its tag. GUND introduces the Baby GUND Animated PeekA-Boo Bear, Bear an 11.5-inch teddy bear featuring a moveable mouth and arms that move up and down during play. At the push of a button, the bear recites one of six different phrases and hides behind the blanket before popping back out for an interactive game of peek-a-boo. The Baby GUND Sleepy Seas Sound & Lights Whale is a plush whale that helps sooth babies to sleep with relaxing sounds and soft, glowing lights. There is a music icon that releases 20 minutes of continuous soothing sounds when pressed. Parents or kids can press the spiral icon to shuffle through five options of calming whale sounds, soothing ocean, gentle bubbles, white noises with waves, and “Brahm’s Lullaby.” Circles of light glow from within the whale’s cheeks to create a soothing ambiance. Shimmer Stars, from KD KIDS,, are plush animals that kids can decorate with the included Shimmerizer Wand. Designed for kids ages 4 and up, the Shimmerizer stores more than 200 shimmers in different shapes and colors. To use it, kids place a shimmer on the star, use the Shimmerizer to pick it up, and press the button to add shimmer to the plush animal’s fur or to their own hair. Shimmer Stars feature three wear-and-share fashion accessories so kids can match their plush pets. Shimmer Stars will be available this fall in unicorn, panda, cat, and dog versions. KD Kids expands its Rescue Runts line with Rescue Runts Babies, Babies, 4-inch plush pets that arrive in plastic crates. Kids ages 3 and up can pick out their fleas, brush their messy fur, and tie a ribbon collar to transform them into loved pets. The crate also features interlocking walls and can transform into a bed, a cubby, a carrier, or a house for the Rescue Runt Baby. There are more than 20 pets to collect, including cats, dogs, wild animals, and mythical creatures. Starlight Musical Unicorn, Unicorn from DOUGLAS TOYS, TOYS, is a 15-inch musical plush with a music box and projectable, long-life LED lighting inside. The light and sound activation buttons are built into the plush on the front paws, and it has an indepenJaxton the Dog dent on/off light and Rainbow Fuzzle sound switch. Once turned on, the animal projects a calming moon-and-stars pattern on the ceiling. The plush plays multiple soothing lullabies on repeat, and automatically shuts off after five minutes. It is designed for all ages. Jaxton the Dog Rainbow Fuzzle resembles a classic sheep dog, with long, crinkled, pastel rainbow fur. The plush is 19 inches long and features a shiny, black nose and lavender eyes. Fuzzles are ultra-floppy, ultra-soft, and designed for kids ages 3 and up. Jimmy the Teddy Bear Bear, from STEIFF, features a contemporary design and ultra-soft fabric. The teddy bear is designed for creative play, comfort, and companionship for all ages, and is available in three sizes: 8 inches, 12 inches, and 16 inches. Star, an 11-inch soft Starry Sea Star puppet for all ages, features a coral-colored body decorated with pink spots, some of which have embroidered edges. Her eyes and smiling mouth are stitched in black thread. Starry’s face and arms are made of short-pile plush; the reverse side is sewn from a longer, pile fabric. Beanbags are hidden inside the ends of the starfish’s two lowermost legs for weight and stability. ANIMOODLES introduces the Animoodles Storytale Forest Collection, Collection, the second collection in the Animoodles line. There are six new magnetic, buildable stuffed animal characters, including Jada Panda, Odin Dragon, Sammy Fox, Rosie Deer, Hannah Owl, and Sweetie Bee. Each Animoodles animal is made of six detachable plush parts with magnets hidden inside for kids to attach different parts to other Animoodles. Kids can also mix and match them to create animal hybrids, or stick Animoodles onto refrigerators and lockers. When fully composed, each plush stands 7.5 inches tall. Animoodles are designed for kids ages 3 and up. PLUSH The Lights & Stripes Zebra Zebra, VTECH, features bold from VTECH black-and-white stripes, colorful patterned fabric, and a variety of textures to enhance tactile awareness. The zebraâ&#x20AC;&#x2122;s tummy plays endearing phrases and introduces colors through upbeat songs while it glows in five different colors. The plush has a washable surface with removable electronics. HABA USA introduces Snug-Up Doll Edda, Snug-Up Doll Dorothea, and Snug-Up Doll Roya.. They have soft bodies to keep kids company throughout infancy and early childhood. Doll Coco has an embroidered face with rose cheeks, dark brown eyes, and freckles. Her brown hair is pulled back in a floral headband, and she is dressed in a greenand-pink, floral dress. She has removable clothes and a beanbag bottom so she can sit on her own. All soft dolls are designed for babies ages 18 months and up. The Butterfly Counting Pal, Pal, from LEAPFROG,, is a plush learning toy with five colorful number buttons that play a variety of songs to teach kids colors and numbers. The butterfly’s light-up wing shows the colors of the rainbow and helps babies fall asleep with soft, classical melodies. Each segment of this onthe-go toy features a dangling toy that rattles, squeaks, turns, or crinkles to help develop fine motor skills. The butterfly includes straps to secure it to infant carriers and strollers. SKYROCKET expands Pomsies with new characters, sounds, and features in Wave 4, available this summer. These wearable pom-pom companions are designed for kids ages 3 and up and feature two modes of play: Virtual Pet Mode and Freeze Dance Mode. Pomsies’ eyes light up in different colors to indicate when they are feeling happy, sleepy, or hungry. When kids pet one of three touch points on the Pomsie’s head, nose, or mouth, Pomsies will react with Pomsie up to 50 different responses. Wave 2 of Pomsies Poos launches this fall with new characters, designed for kids ages 3 and up. The Poos are miniature versions of Pomsies plush without the electronic features but with the same wraparound tails so that kids can take and wear them anywhere. Kids can attach the heart-shaped clasp to backpacks, clothing, and more. Rainbow Fluffies, Fluffies, from JAY@PLAY JAY@PLAY,, are rainbows stuffed with animals. Kids can unfluff the rainbow plush toy to transform it from a rainbow into an animal and back again. There are nine Rainbow Fluffies for kids to collect. Wish Me Zoonicorns have horns that glow when kids kiss their noses, and each one has four touch points that make them light up, giggle, and make other noises. There are four Wish Me Zoonicorns to collect: Ene, Promi, Valeo, and Aliel. Both products are designed for kids ages 3 and up, are available online now, and will hit retail shelves this fall. TOMY launches a soft plush line called Club Mocchi- Mocchi- this spring, designed for kids ages 3 and up. Designed in Japan, Club Mocchi- Mocchi- plush toys have a squishy texture and are soft to touch. TOMY launches its first series of Club Mocchi- Mocchi- with Mario Kart plush toys that feature characters from the Nintendo game, available in a mega plush size and clip-ons. The mega plush will be available in red shell, blue shell, and mushroom styles. The clip-ons will be available in bullet, star, bomb, banana, green shell, mushroom, and red shell styles. MMG BRANDS expands its Large Moosh-Moosh Plushies collection with series four, Halloween Series, Christmas Series, and the Sequin Collection. MMG Brands launches Moosh-Moosh Squared Pattern Plushies,, 10-by-10-by-10-inch squishy, cubed characters that are available in nine styles, including a shark, a zebra, a cow, a corgi, and more. MooshMoosh features details such as Bumblebee’s antennae and a daisy tucked behind Cat’s ear. but disappeared from toy companies’ new product lineups. Gerrick Johnson, director of BMO Capital Markets, says this drone bust comes from high investment, thin margins, and too much competition. Liolios Managing Director Sean McGowan agrees, noting that, as with many trends, the “faddish nature faded.” Also, he says, people don’t really collect drones. “If you want one, you buy it, and you are unlikely to buy another one,” McGowan says. “If it keeps working properly, you don’t need another one, and if it isn’t working properly, you don’t want another one.” The nature of drones, too, puts their play value at risk. McGowan notes that ﬂying toys’ limited battery life impacts the length of time kids can play, and outdoor use means drones can break or end up on the roof — resulting in frustrated customers returning the product. LICENSE TO SELL R/C vehicles continue to sport a variety of licenses, including Spin Master’s new Monster Jam vehicles and Mattel’s Imaginext DC Super Friends Transforming Batmobile. One recent, signiﬁcant R/C licensing deal was when Jada Toys acquired the vehicles license for Ryan’s World, based on the popular Ryan ToysReview YouTube channel. According to Darryl Li, marketing director at Jada Toys, the company was a bit skeptical of the license at ﬁrst because kid inﬂuencers are so new to the toy market. However, the company saw an opportunity to further expand its preschool portfolio and move away from its reputation as a die-cast company for collectors. Expanding upon its rock-crawling R/C offerings, MAISTO TECH introduces the Rock Crawler Pro Series 4WS. This 15-inch, off-road vehicle features true four-wheel steering: Kids use a switch on the controller to choose which wheels they want to control. With this feature, kids can turn a tighter radius and maneuver diagonally. The company also introduces the Cyklone Drift, an R/C with 40 individual wheels so that the vehicle can perform drifting stunts and 360-degree spins. It is about 10 inches long and features a 115-foot range and working lights. Both R/C vehicles are designed for kids ages 5 and up. JADA TOYS introduces a line of Ryan’s World products inspired by the YouTube channel Ryan ToysReview. Kids can spin, pop wheelies, and do tricks with the Skateboard Stunt R/C Combo Panda using the included controller. The R/C features a 9-inch character that rights itself when it falls over. Kids can also play with Ryan and his friends with Ryan’s Racers, 3.5-inch, die-cast vehicles featuring fully functional wheels and a nonremovable Ryan’s World character. These vehicles also work on the Ryan’s Track Set. Both products are designed for kids ages 3 and up. Auto Moto Battling Robots, from ODYSSEY TOYS, transform from sporty race cars to robots with the push of a button. The R/C functions in both car and robot form. Each pack comes with two cars and two remotes so kids can battle the robots. When one robot is punched in the “heart” three times, it transforms back into a car. Odyssey also introduces the FPV ATV, an R/C that gives kids a view from the car itself. The car is designed for all terrains and features a high-deﬁnition camera mounted on top, which can livestream to and record on a smart device. Kids can choose to drive the car with the included standard remote control or use a mobile device to drive the ATV. NKOK launches its Earth Movers line, which includes customizable construction sets and R/C vehicles. The ﬁrst three R/C vehicles in the line are a Dump Truck, a Wheel Loader, and an Excavator featuring a working boom and bucket with three points of articulation. Kids can select from an auto digging mode or a manual digging mode with the push of a button. NKOK also takes things to the water with Hydroracers, a new line of R/C boats. The line includes a Jet Ski with a rider and a Fire Rescue Boat with a built-in water hose. Kids can run these vehicles in a pool, pond, or lake. Both lines are designed for kids ages 6 and up. ALPHA GROUP releases Grrrumball, an R/C creature designed for kids ages 6 and up. Grrrumball features light-up eyes and sound effects. The R/C also has two attack modes — Spin Attack and Arm Smash — that kids can activate with the remote. SPIN MASTER expands its Monster Jam offerings with the Ofﬁcial Monster Jam 1:10 R/C Grave Digger Truck. Kids can perform stunts, crashes, and bashes with the large truck, which features four authentic monster truck sounds, lights, and realistic Grave Digger features. The truck is designed for kids ages 4 and up. HASBRO introduces the Marvel Spider-Man Titan Power Cycle, part of the Titan Hero Power FX 2.0 Series. Kids Pack Cycle ages 4 and up can plug the Spider-Man ﬁgure into the motorcycle to activate sound effects or connect the included Power FX Pack to the ﬁgure’s arm port to hear Spider-Man phrases and sounds. Swap with other characters’ packs to hear Spider-Man speak to whichever character is wearing his power pack. Knuckle-Headz Head Poppin’ Racers, from SKULLDUGGERY, are fueled by a pull-back motor and have a fun twist: When the vehicle hits something head on, its spring-loaded head pops off. There are six characters to collect in both single and double packs. Kids ages 3 and up can face off their Knuckle-Headz in a head-on battle to see whose car keeps its head. Skullduggery also introduces RC Marble Racers. Designed for kids ages 5 and up, these cars feature rear-wheel-drive for hairpin turns and drifts. The car’s clear chassis gives kids a view of the motor and gears inside the car and the 1.25-inch LED marble lights up as the car moves. The racer is available in four colors. SMART ZONE expands its Mighty Wheels line with a 16-inch Cement Mixer and a 16-Inch Crane.. The vehicles are made of heavy-duty steel and plastic and feature sound effects. The mixer spins when kids turn a crank, and the crane’s hook expands and retracts. The vehicles are designed for kids ages 3 and up. 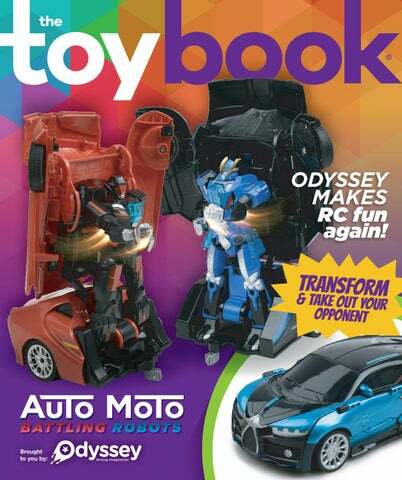 ODYSSEY TOYS DRIVES TOY INNOVATION IN 2019 The Toy Book catches up with Odyssey Toys’ Head Toy Maker Sal Irigoyen about the company’s growth and what sets it apart from other R/C companies. Toy Book: Tell us about how Odyssey Toys got its start. Sal Irigoyen: We started back in 2006 because my friend, who was the vice president of merchandising for Home Shopping Network at the time, asked me if I could source toys for him for the network’s Christmas in July shows. I went to China and found three to four items that all sold out within the ﬁrst couple of shows. We had to run back to ﬁnd more for the fourth quarter, and those also sold out. After being in the consumer electronics business for 25 years and in the music industry for ﬁve, I decided that toys were for me. At ﬁrst we didn’t even brand the products that we brought in, and my wife ran customer service from an ofﬁce in my house. Then in 2008, we went to our ﬁrst show at Toy Fair New York, and Odyssey Toys was born. TB: What makes Odyssey Toys different from a traditional R/C company? SI: We always strive for uniqueness and try not to be a “me too” company. If somebody else has it, we don’t want it. We also look for new technologies before they become mainstream, and that gives us an edge over other companies. Our factories in China always present new concepts to us, and we try to make those into products that have the fun factor. TB: What new strategies are the company taking to keep up with the changes in the R/C category? SI: When we realized that everyone started copying drones, we started designing new products that were based on land, which is where we originally started in the R/C category. Although, and I hate to sound like a broken record, but our strategy is designed all around fun and uniqueness from everyone else. Regardless whether we produce ﬂying drones or land R/C, our uniqueness makes us stick out. MEET THE PRESS Put your products in front of the most influential people in the country! • The What’s Poppin’ Lounge will be featured at Sweet Suite on July 24, 2019, in New York City. • Attendees include national and local TV producers, newspaper and magazine editors, and top-tier digital influencers. James Zahn, best-known as The Rock Father, is senior editor of the Toy Book, the Pop Insider, and the Toy Insider. A true multi-hyphenate, he is a media personality, writer, commentator, consultant, actor, adventurer, raconteur, and overall pop culture and toy enthusiast. He is driven by a fascination for the business of play, with a strong interest in consumer habits, product development, and retail trends. come through the reveal, and are not often disappointed about what’s coming out on the other side.” Many toys have the unboxing blind reveal, a tactile surprise to touch, and a transforming play set, but what really piques kids’ interest is that “it” factor and that moment of awe when they open their toys for the first time. “There’s so many different types of reveal toys out there,” Scheftic says. “We wanted to make sure that we had a [wow] factor for anyone who saw it [Blume], and not just the first time but the second, [and] the third. There’s that repeat excitement that comes with revealing because you don’t know what’s going to pop out the pot.” » Miranda Siwak is an editorial assistant at Adventure Publishing Group, where she contributes to the Toy Book, the Toy Insider, and the Pop Insider. You can ﬁnd her covering the latest toy and entertainment industry news for both online and print. New from MAYA GROUP, Foodie Roos are plush characters that smell, look, and feel like certain foods. Each plush character comes in a food container that kids ages 5 and up can open to reveal a different character. Once open, the container becomes a house for the Foodie, and kids can feel a surprise in each Foodie’s belly. The line of 20 collectible characters will be available this summer. Pop Tops, from PLAYMATES TOYS, are detailed, stylized collectibles based on licensed characters. The 2.5-inch figures pop open from an oversized head into a full-bodied figure with the press of a button. Designed for kids ages 3 and up, the first wave of characters takes inspiration from Marvel’s Avengers and the Teenage Mutant Ninja Turtles. MGA ENTERTAINMENT takes its L.O.L. Surprise! line to a new level with L.O.L. Surprise! Makeover Series #Hairgoals. Kids can unbox the glamorous dolls and their fancy new looks. Each #Hairgoals reveals 15 surprises, accessories, and real or glitter hair. Each mystery capsule resembles a hairspray can that transforms into a salon chair, display case, and doll stand. There are 12 dolls kids can collect. RELEVANT PLAY PLAY’s Mad Mattr 1, deMeteor Monsters Series 1 signed for kids ages 5 and up, features blind packs of mystery monsters inside Mad Mattr compound. Kids can fill the container, twist the top off, smash it open, and lift the compound out to watch each monster break out. Each colorful creature will escape in a different way. The Mad Mattr Mini Meteor Monsters feature a two-in-one blind pack of miniature creatures for kids to collect. The line includes more than 100 mini-monsters. With Tony Hawk Box Boarders, from HOG WILD, kids can perform skateboarding tricks with the 16 collectible box skaters. Kids can skate their figures around and land tricks on the included ramps and pipes. Kids ages 4 and up can also make these skateboarding figures can flip, ride, or grind to perform impressive stunts. JAKKS PACIFIC introduces Piñata Fiesta with Piñata 1, available this fall. Designed for Fiesta Collectible Series 1 kids ages 4 and up, each collectible piñata is available in 12 different themes, such as unicorn, cupcake, watermelon, doughnut, and pony. Kids can pull the strings to open different compartments and reveal hidden surprises. The reusable piñata includes charms, jewelry, stickers, and confetti, based on the different party themes. Kids can collect all 12 piñatas and 36 charms. In late fall, Piñata Fiesta Series 2 brings 12 new, sparkly piñatas for kids to discover. Jakks Pacific will also introduce Mega Man Basic Figures so that kids can collect the iconic character Mega Man and his film cohorts. Each Robot Master includes a swappable Mega Blaster arm cannon based on the characters. MINDWARE introduces Dig It Up! Discoveries Dragons for kids to reveal surprises inside the golden mystery eggs. Designed for kids ages 4 and up, there are 12 individually wrapped eggs that kids can excavate and chisel away to reveal the dragon inside. TOMY introduces Ritzy Rollerz, a collectible line of vehicles, each designed with its own personality and features. Each animal-based character has different “adorability” features, such as real hair, fur, and chrome finishes. Kids can outfit each Ritzy Roller with different accessories and charms, discover mystery surprises hidden inside the trunk, and wheel the figures around. JUST PLAY introduces Ryan’s World Smashin’ Surprise Safe for kids ages 3 and up to unbox toys, inspired by Ryan ToysReview. Surprises include figures, tattoo stickers, and slime, with more than 30 to collect. Each pack comes with five mystery safes for kids to smash. T.O.T.S. Surprise Nursery Babies are mystery baby animal figures, coming this fall. Kids can reveal the fuzzy baby animal, then nurture and care for the babies. Luvi Pups,, from REDWOODVENTURES, are stretchy, tactile puppy figures that kids can tug, pull, and squeeze. Available this summer, each mystery pup comes with surprise dog toys. Kids can collect different puppies in every package, including the ultra-rare runt of the litter. WOWWEE expands its Fingerlings range with the Fingerlings Narwhals. As they sit on kids’ fingers, the narwhals use motion sensors to detect when kids surf airwaves with them. They also feature a mood horn that can change colors in response to interaction and react when kids pet them and give them a “kiss.” Kids can extract the Untamed Mad Lab Minis, miniature versions of hybrid creatures from the Untamed by Fingerlings series, from Geoslime, Biosand, or Terraclay. The different heads and bodies are swappable to create different hybrid characters. With Pop Pops, from YULU, kids can pop the air bubbles to reveal oozy slime and a collectible figure inside. Pop Pops Pets include more than 60 collectible animals, while Pop Pop Snotz feature hidden gross alien figures inside the oozing slime. EDUCATIONAL INSIGHTS expands its Playfoam Pals line with Playfoam Pals Fantasy Friends and Playfoam Pals Monster Party. Each range includes 12 new characters for kids to collect. Each figure is hidden inside the squishy compound for kids to discover. LEARNING RESOURCES expands its line of Beaker Creatures collectibles with Beaker Creatures Series 2 Reactor Pod. The new range includes 30 collectible creatures, such as Swampoids, Bytebots, and Frostonians. Each pod is packaged in individual blind boxes with a different figure for kids to reveal inside. Kids can make stop-action videos with Klikbot, the newest addition to ZING’s Stikbot line. The collectible figures feature multiple points of articulation and interchangeable pieces for creating new figures. With MATTEL’s Disney•Pixar Toy Story Minis Assortment, kids can collect miniature Figure Assortment figures based on the characters from Toy Story 4. Each figure, including Woody, Buzz, and Jessie, comes in a blind bag for kids to unbox. The Fisher-Price The Beatles Yellow Submarine by Little People is a special, celebrity four-pack of Little People figures. The four members of The Beatles are depicted and stylized based on “Yellow Submarine.” The figures will be available this fall. Kids can unbox the Rainbow Butterfly Unicorn Kitty 9 Lives Surprise Assortment,, from FUNRISE FUNRISE,, to transform the Kitty Can container into a multi-level, miniature play set. It also comes with two collectible mini-figures, six accessories, and a sticker pack to customize the set. Fart Ninjas Series 1 are collectible ninja figures that launch a fart attack, activated by a motion sensor. There are eight different characters that come equipped with 10 realistic fart sounds. has a passion. The line includes toys that few adults get but that kids go crazy for, including super slimy slime, blind bag collectibles, plush, racing vehicles, squishies, and a giant surprise egg — all from Bonkers Toys. A 75-city experiential tour is in the works so that kids can fully engage with the Ryan’s World brand. Ryan will appear at select venues in person to surprise his fans. While most kids will never meet him or take part in the tour, the idea that they can acquire Ryan’s favorite toys and play along with him is a not-to-bemissed opportunity. PACKAGED BY A KID, FOR KIDS Since Ryan came to fame unboxing toys, it isn’t any surprise that his own, hand-selected toys are boxed in a manner that appeals to him and his audience. The brand-centric logo conﬁrms this. A smiling, rising sun over multicolored “Ryan’s World” lettering is held within a burst. Some of the packaging depicts Ryan himself in his characteristic thumbs-up pose, signaling his approval of the toy. His stamp of approval is all most kids need to see to clamor for these toys. The signature brand color is red, but the packaging is ﬁlled with bright, primary colors, as one would expect to see on toys aimed at young kids. Due to Ryan’s notoriety, much of this packaging is meant to be savored and kept as long as the toys are. Take the Giant Mystery Egg. Each egg features an exclusive lights-and-sounds vehicle, ultra-rare ﬁgures, special slime and putty, a limited-edition squishy, plush, and more. Plus, no two are the same. How cool is it for kids to unbox and play with the toys contained inside and then experience the thrill of doing that over and over again, just as Ryan does? PACKAGING A MYSTERY Who doesn’t like a surprise? Some of the greatest recent toy hits feature uniquely packaged toys that hide what is inside. Spin Master’s Hatchimals eggs and MGA Entertainment’s L.O.L. Surprise! Ted Mininni is president and creative director at Design Force Inc., a package and licensing program design consultancy to the consumer product and entertainment industries. The goal of Design Force is to establish strong emotional connections with consumers and create powerful visual brand experiences that engage, excite, entertain, inspire, and inﬂuence consumers’ decision to buy. Mininni can be reached at (856) 810-2277. Visit designforceinc.com for more information. Howard N. Aronson has provided legal counsel to toy industry companies for the past 30 years. He is the managing partner of Lackenbach Siegel LLP, an intellectual property law firm recognized for its nine decades of handling toy company issues. Grateful acknowledgement is extended to Eileen DeVries, counsel to Lackenbach Siegel. This spring, DC Comics launches two new imprints for young readers. DC Zoom will cater to readers ages 8 to 12, while DC Ink will focus on titles for kids ages 13 and up. DC Zoom kicks off with Super Sons: The Polarshield Project. From New York Times best-selling author Ridley Pearson (Kingdom Keepers) and artist Ile Gonzalez, the first book in a threepart series follows the adventures of Jon Kent and Damian Wayne — sons of the world’s greatest heroes, Superman and Batman. DC Ink begins with Mera: Tidebreaker. New York Times best-selling author Danielle Paige and artist Stephen Byrne tell a new story of Mera and Aquaman that explores Mera’s first steps on land. Will she choose the path of a hero, or that of a villain? New titles will feature DC Super Hero Girls, Harley Quinn, Swamp Thing, Teen Titans, Black Canary, Wonder Woman, and more. vated the value that mentorship has on future generations, vowing to dedicate her career to empower the next generation of leaders. Kaufman inspired and fired up the crowd of 800 women and men to be better leaders, and her message resonated with me both professionally and personally. I was inspired to take action and to mindfully practice mentorship every day in my role as WIT’s executive director and as a mother of four young men, who are just starting out in the business world. Here are the five guiding principles in Kaufman’s philosophy on mentorship that she shared during the Wonder Women Awards. 1. Make everyone feel heard. This was a lesson Kaufman picked up from her mom. She talked about the importance of making everyone in the room feel included, acknowledged, and heard. 2. Motivate, motivate, motivate. Every leader should be the chief motivational officer for their team. 3. Willingly share your successes and failures. A good mentor will share her failures with others so they can be better. Mary Kay Russell is executive director at Women in Toys, Licensing, & Entertainment and The WIT Foundation, a global nonprofit organization that champions the advancement of women through leadership, networking, and educational opportunities. Prior to her role at WIT, she worked in the toy industry in multiple roles, such as a marketing professional, inventor, and manufacturer. TEL: 201-784-7727 FAX: 201-784-1912 E-MAIL: murraybass@playtimesales.com lensoyka@playtimesales.com carolleeman@playtimesales.com The Playtime Sales & Marketing Company, LLC. is a Toy and Electronics Manufacturers sales representative organization. Our prime focus is to represent Toy and Electronics Manufacturers to the Mass Market Retailers. The principals of our Company are Len Soyka and Murray Bass. Our only vocation has been in the Toy Industry. We are dedicated toy professionals. Our geographical areas of sales coverage and accounts include: • NEW ENGLAND…Connecticut North to Maine and Upstate N.Y. Accounts… CVS Drug, BJ’s Whle Club, and TJ Maxx, • NY METRO​ NY City and New Jersey. Accounts... dd’s Stores, Macy’s Backstage, Cititrends, Burlington Stores, Xmas Tree Shops, Shepher Distributors, Buy Buy Baby, Party City, National Whle., Bed Bath and Beyond, Stevens Intl., and NY area Supermarket chains. • MID-LANTIC…Pennsylvania, Washington D.C., Northern Virginia and Western Ohio. Accounts…Rite Aid Drug, Group Sales, Boscov’s, 5 Below, Dollar Tree, Variety Wholesale and Big Lots. • K mart USA // JC Penney Catalog // Universal Studios Orlando // Target and Walmart • CANADA…Walmart, Toys R Us, Canadian Tire and Costco • CHINA…We maintain a full time Hong Kong sourcing Office We employ a staff of 5 toy sales specialists. Our contact information is listed on our above shown letterhead. We welcome your inquiries. LEGO Racers and LEGO Rock Raiders are the ﬁrst LEGO software available for PlayStation and PC CDROM. Players can explore and excavate the underground tunnels of an unexplored planet in LEGO Rock Raiders. In LEGO Racers, players customize their own race car and driver. Then, they can challenge ﬁve other drivers in landscapes based on LEGO System themes: castle, town, space, and adventures. THE DOLL CATEGORY EXPANDS FROM TRADITIONAL TO TECHNOLOGICAL Playmates’ Amazing Ally looks like a real little girl. Her face and lips move as she talks. What makes the doll truly unique is that Ally can interact with a child as if she were alive, much like last year’s Amazing Amy doll. However, Amazing Ally is made to be a kid’s best friend and give them attention. THQ EXTENDS MULTIPLATFORM LICENSING AGREEMENT WITH NICKELODEON FOR RUGRATS THQ and Nickelodeon will continue developing interactive video games worldwide based on Rugrats through December 31, 2002. The new deal gives THQ the exclusive rights to the Rugrats property for all current and future game systems from Sony, Nintendo, and Sega. THQ intends to publish one of the ﬁrst interactive, 3D board games for Nintendo 64, Rugrats: Scavenger Hunt, a new Game Boy Color game, and an updated PlayStation sequel to Rugrats: Search for Reptar. Mattel’s The Rosie O’Donnell doll is the ﬁrst in a collection of Barbie’s celebrity friends. She is sculpted to look like the famous talk show host and comes with a microphone; a chip art copy of her new book Kids Are Punny 2; and an activity book with jokes, crafts, and tips from O’Donnell on hosting a talk show. A donation to For All Kids Foundation is made with the purchase of every doll. A new Blue’s Clues line, from Tyco Preschool, includes » the Goodnight Blue and talking storybook. Preschoolers read the story to Blue, who is dressed for bed. When they press a button on each page, different characters say unique phrases. With each successive page, Blue’s eyes slowly close and her ears lower as she fades off to sleep. Reach Millions of Shoppers This Holiday Season The Toy Insider runs in the November issue of Family Circle magazine. Family Circle readers purchased nearly 41 MILLION toys in 2018, worth nearly $1.4 BILLION. The Toy Insider Team appeared in more than 300 national and local TV segments in 2018, showcasing the BEST toys to millions of consumers all season.